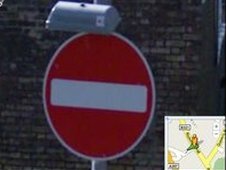 21 05 2009 - Google's Street View feature isn't even available in Germany yet, but already officials there are threatening the company with sanctions if it doesn't modify the service. It's against German law to distribute photos of people or their property without permission. Because Google's Street View crews typically photograph everything in sight, it would be difficult for Google to comply with that regulation. But the company has proposed that Germans could ask that their property not be photographed. They have also said that once the service launches people will be able to ask Google to remove certain images, according to a report in the IHT. It's the latest regulatory bump for Street View in Europe. Google said Wednesday that the European Union's Article 29 Working Party?which represents data protection officials from EU member countries?wants the company to notify the public before it starts photographing scenes. "As you can probably imagine, this can be a bit tricky due to ever-changing weather and lighting conditions, but we are committed to working within their guidelines," says Noam Ben Haim, Google's chief cartographer for Europe, the Middle East, and Africa. In the U.K., privacy advocates filed a formal complaint earlier this year with the government asking that the service be shut down. The U.K.'s Information Commissioner's Office ultimately ruledit would be "disproportionate" to outlaw the feature, considering the small risks it poses to people's privacy. Google is even more dominant in Europe than in the U.S. For instance, it had about 80 percent of the search market in Germany a year ago, according to comScore and nearly 90 percent in Great Britain, according to Hitwise.